If you are finding that your little one doesn't want to sit still for your project; I recommend adding large shapes for them to fill. I am absolutely in LOVE with Rad & Happy Color Happy. It is a coloring subscription that you get several coloring pages each month, and delivered to your inbox, for unlimited printing for only $5. I absolutely love her style. There are 3 levels of coloring pages. 1 of the pages that come in each month are super easy for littles to color or fill in. Perfect for fine motor skills, this craft for Thanksgiving week or fall. You can choose to dye your kernels to create beautiful mosaics, and you can leave the kernels plain to teach them how to make glue lines and placement. This activity was offered in a series of activities in XO Playtime. It started as a mosaic, but my son is known for his inability to sit still. 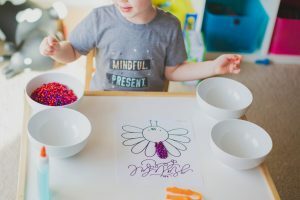 It became a whole sensory experience of mixing colors, grabbing fistfuls of his rainbow kernels, and running his hands over the textures. Allow your child to play and explore. Not every activity is required to be super structured. Let mixture sit overnight for best results. Once the craft area is set up, place glue, and model behavior. If your child is younger show them how to make a mosaic and create patterns. Enjoy with low expectations that it might turn into a mixing and sensory activity.